Like most people with Monday-Friday “normal” type jobs, I used to really hate Mondays — back to the grind of getting up, facing a dreadful commute, and spending the day in the office after I’d had a blissful two days of doing my own thing. Now, though, I actually really like Mondays. It helps that I’m doing something I love, that I’m doing it at home with no commute, and I work for myself, so I set my own schedule. I let myself get a slow start on Mondays, if I want to. Weekends are often busy for me, and especially Sundays, so Monday is generally my “sleep in” day. I linger over the newspaper and a cup of tea before launching into my week, which is so much more civilized than being forced to go to work at the usual time right after a weekend. Monday is usually a day for staying at home and not dealing with people. But I also love the sense of a fresh start that Mondays give me. It’s like a New Year’s Day every week. If I slacked off or didn’t accomplish what I wanted last week, that’s all in the past and I can make new resolutions for the new week. I can accomplish all the things, eat right, exercise, and make progress on organizing my house. I can spend time writing, get projects completed, and all those other things I really want to do. I can set up new schedules and guidelines for myself (you sometimes have to resort to tricks like this when you don’t have a boss or a strict deadline, and therefore there’s nothing to stop you from spending the day reading message boards about TV shows you don’t even watch if you don’t set up some kind of structure). So, I’m starting today with a lot of enthusiasm, with maybe a dash of fear because I woke up this morning from the recurring “back to my old day job” nightmare. That one seems to have taken over from the “I’m running late for the final exam in the class I forgot I was taking and never actually went to, and I don’t know for sure where the exam is being held” nightmare that was my brain’s previous favorite. It’s never actually really any of my old day jobs, but it’s one like one of them, or it may be one of my old jobs in the dream, and it’s only upon waking that I realize I never actually worked at that place. 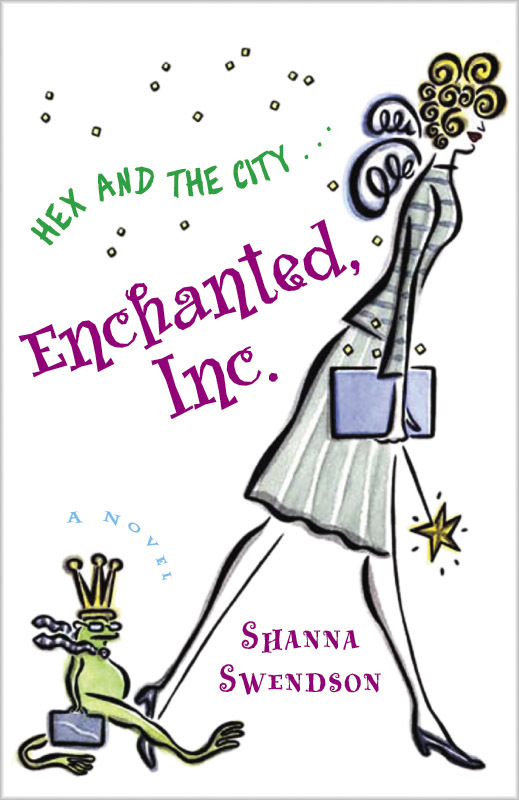 The bizarre detail from this particular dream was that my boss had come into my office to talk about something, a call for her (not an actual person I’ve ever worked for — I think it might actually have been Mimi from the Enchanted, Inc. books) got forwarded to my desk, and I got out of the way so she could take it. It wasn’t just a quick answer to something, and it looked like she was settling in for a long chat, so when she sat down at my desk, I slipped out of the office to give her some privacy, only then remembering that I’d taken off my shoes while I was sitting at my desk, so now I was barefoot. When my boss finally got off the phone and left my office, she criticized me for not being at my desk, working, and asked why I wasn’t wearing shoes. Which sounds like something Mimi would do. And now I kind of want to see if I could pull off a short story from Mimi’s perspective, where she’s running into magic but doesn’t realize it as she continues being an irrational boss. And I really, really don’t want to have to go back to working for the kind of people who inspired Mimi, so I guess I’d better start writing.